When buying a property in Turkey you should also include in your budget the extra costs involded . The actual property price will then have the additons of purchase costs including a lawyer, notary, taxes, and relevant fees. The fees for services provided by lawyers and translators can vary depending on whom you choose to use. Other official costs are also set in Turkish lira, therefore the amount in your home country currency will change according to exchange rates at that period of purchasing a property in Turkey. Our below figures are approximate costs only but in general, you should work on 8.5% to 9% to cover all fees and charges. Translation services: Some translators provide a set fee particular for property purchases, whilst others can charge per hour . Translators in Turkey have to be officially registered and licensed. Notary offices in each district have a list of licensed translators or , we can recommend one for you. Our Fee: We are not charging any comission for new properties.However We are charging % 3 of the property purchase price only for resale properties. Transfer Deeds Tax: This is 4.4% . Please note, that the amount to be paid goes on the assessed value, not the actual purchase price. Every council has a list of estimated property values and they will use this to calculate the tax to be paid . DASK Insurance: This is compulsory earthquake insurance in Turkey and is required at the time of signing for your title deeds. The cost depends on the square meterage of your property. DASK for a two-bedroom apartment measuring 70 square metres is roughly 250 lira a year. Military Checks: An offical application is made to the government to check the property you are purchasing is not within a military zone and that you as a foreigner are within your legal limits of assets you can buy. 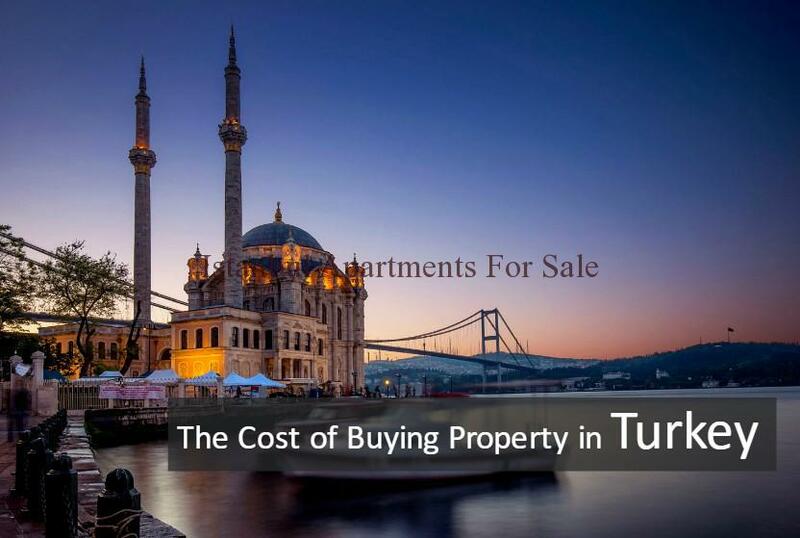 The following is an example of the one-off costs of buying property in Turkey. The figures given here are representative of a property sale of 100,000USD. Figures are in USD (USDollar) . When buying a property in Turkey you should also include in your budget the extra costs involded . The actual property price will then have the additons of purchase costs including a lawyer, notary, taxes, and relevant fees.